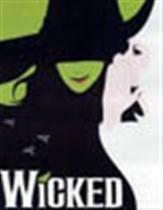 Wicked tells the story of two girls in the Land of Oz. One, born with emerald-green skin, is smart, fiery and misunderstood. The other is beautiful, ambitious and very popular. How these unlikely friends end up as the Wicked Witch of the West and Glinda the Good Witch makes for the most spellbinding new musical in years. Young people are going wild for Wicked. It's not a show for children under eight though. Wicked is a rich show with Oz-related surprises and clear messages. Children under four are not admitted. Free time will also be allotted today to enjoy New York City.